In the fifteen years we’ve been traveling together, we have discovered the one thing that, above all else, makes for happy traveling. More than making sure you have bandaids (though that’s important), printing out double copies of your travel documents (always a good idea), and researching the first place you’ll eat so you avoid a garfunkel, it’s a simple, two-word concept. No, really. Pack light: no seven pairs of shoes, no curling iron, no twenty-seven different beauty products. We became converts to packing light on our third or fourth vacation. Coincidentally (not really) it was the one after the airline lost our luggage. Before that, we had been packing like most couples for a longer (week or so) trip: one large suitcase, one wheelie bag, a couple of carry-ons each. Of course, that means checking bags, waiting at baggage carousels, and–most critically–trusting the airline with your bags. We had always been fans of Rick Steves, who advocates carry-on only, whether you’re going away for a week or three months. I know what you’re thinking. But it can be done, and we are proof. We do not sacrifice comfort and looking decent wherever we go. But we have taken week or longer vacations to Venice, Budapest/Prague, London, Paris, Morrocco/Madrid, Nicaragua, Belize and Ireland, all with a carry-on sized backpack each. The most challenging was probably the Budapest/Prague trip, because we went in late November, and the weather is about like here in Boston – pretty chilly – so we needed sweaters & layers. Now, full disclosure: we do not attend fancy balls, requiring special evening attire, which would of course necessitate more room in luggage. We generally are not eating in Michelin-starred places – we prefer casual, local dining with the occasional splurge restaurant, so we do the research to be sure Rob will be fine with a blazer and chinos or jeans (fine for most places in larger cities, including Paris & London). A scarf or pashmina over a nice sweater or blouse dresses up my outfit just fine. We travel with one pair of nice looking, comfortable walking shoes. Unless the place we’re going involves water activities or a sport, as in Belize (cave swim) and Nicaragua (ziplining), in which case we’ll pack sandals or water shoes. Or, as with our upcoming trip to New Orleans, I’ll pack sandals as it’s a bit cold in Beantown this week (1° F) to wear them to the airport. We don’t buy special clothes for vacation*, and we don’t pack a different complete outfit for each day. We wear a pair of jeans two or three times, sweaters the same; t-shirts and other thin shirts just once, but those are light to pack. Nobody knows who you are in London or Prague – they won’t know if you have the same sweater on two days in a row. And even if they do, guess what? They don’t care. Obviously, if we’re talking carry-on only, the tricky part for most people, and a seemingly endless source of confusion at airport security gates still, are the issue of toiletries. Here’s the deal: anything liquid must fit in a 1-quart zip-top storage bag. One bag per person, each item no more than 3 oz. Except for saline solution, that can be outside the bag and up to 4 oz. Why? Who knows, the TSA has some crazy rules. (And to be honest, other countries, like Nicaragua, haven’t gotten the memo about the exception for saline, so it’s easier to just put that in the zip-top bag too; they likely won’t notice that it’s four ounces instead of three). 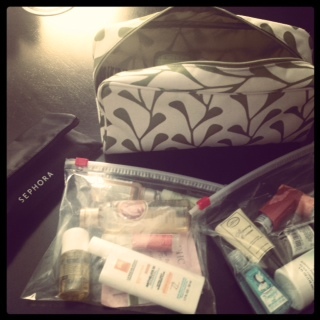 Here’s our actual toiletry kit for our upcoming visit to New Orleans – four nights, five days. The black makeup bag will fit inside the green and white bag, which contains our deodorant, a hairbrush, prescriptions, q-tips, bandaids. The two zip-top bags have all our liquids, which have to be pulled out separately for security so they’ll go in an outside pocket of one of our two carry-ons (we take one duffel-type bag, and one small wheelie). And don’t forget, unless you’re going somewhere really remote, if you run out of toothpaste you can buy more. It can be an experience looking for aspirin in a foreign drug store. The best part of packing light, is that when you reach your destination, you grab your bag from the overhead bin, head off the plane and you’re in line for the metro or cab before all the chumps waiting at the baggage carousel. Think about the people you see hauling two or three gigantic suitcases onto a cart: Do they ever look happy? *The exception was our trip to Belize, deep in the rainforest, which required some quick-drying, wash-and-wear, insect repellent clothing. More on that in another post soon! I saw a rather interesting top the other day for improving the odds of your checked bags. Buy a starter pistol (essentially a cap gun). This requires no permit of any kind, but the TSA considers it a weapon. Then declare when checking the bag that you are carrying a weapon and your bag is treated with kid gloves. The TSA does not like those weapons. Ah, I’ll stick with my carry-on luggage. I suspect that little “psst, there’s a gun in my bag” ruse would not be worth the hassle.